I’ve been a Civil War buff for over 40 years—ever since reading Altsheler’s Guns of Bull Run and visiting the battlefield with my parents. 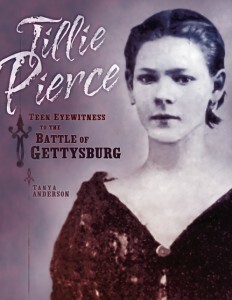 So I admit I was just a tad envious when I learned that my writing buddy Tanya Anderson was turning an amazing, true story into Tillie Pierce: Teen Eyewitness to the Battle of Gettysburg (Minneapolis: Twenty-First Century Books). But I’m over the envy—and instead ecstatic that this book just might help students get excited about history. This Spring 2013 Junior Library Guild Premier Selection is also prime “complex text” with its inclusion of primary sources and detailed information about people, places, and events surrounding the bloodiest battle ever fought on American soil. Yes, that’s really Tillie on the cover of the book. She was just 15 on the morning of July 1, 1863, when thousands of Union soldiers arrived in Gettysburg, hot on the heels of the Confederate cavalry. The Pierce’s neighbor Hettie Shriver, whose husband had joined the army two years before, didn’t feel safe staying in town with her two little girls. She asked Tillie to accompany them to her parent’s farm, a few miles south of town. However, that farm sat just east of Big Round Top and Little Round Top, where some of the fiercest fighting of the three-day battle occurred. Imagine! You’re fifteen. You’re hiding in a farmhouse with cannon fire so close that the windows and very bricks of the house are shaking. When evening comes, and the sounds of fighting die away, new horrors assail you. Wounded soldiers from both armies make their way toward the dwelling, seeking water and medical care. Anderson uses contemporary pictures and quotes from Tillie’s own account to bring scenes alive of trying to escape to safety, of bringing bread and water to soldiers, of catching glimpses of companies and brigades darting across yards and fields, of sitting with a dying officer who turned out to be General Weed, of witnessing amputations and piles of limbs in the farmyard. And, she guides her readers through the aftermath as the armies retreat and civilians are left to deal with the realities of war. I’ll stop there, leaving Anderson’s masterful crafting of Tillie’s experiences as your guide. She leaves no doubt that every word she shares is based in historic fact. The unbearable becomes bearable when you’re right in the midst of it. Don’t skip the Google Earth tour of the battlefield included in the book. The related website, www.tilliepiercebook.com, has links to more information, modern pictures of key sites, and more. My advice? Skip the chapter on Gettysburg in your history textbook, even if you’re teaching high schoolers, and let history come alive for your students through Tillie Pierce. They might just go looking for more! Jane A. G. Kise, Ed.D., is an author and education consultant based in Minneapolis. You can find her at www.janekise.com, and also on Twitter @JaneKise. Jane’s school district DIDN’T use thick history books when she attended a few decades ago; instead, they went to primary sources, essays and other “complex texts,” with choices of how they presented what they learned. Tillie Pierce would have fit right in! She’s at work on her 25th nonfiction book, Leveraging the Positive Power of Differences, and hopes to finally write a fictional tale in the near future. This book sounds amazing and I will be reading and sharing it. Thank. You. After reading this book I felt no choice but to assign it to my students. It has the perfect combination of history, entertainment, and interactivity to fully engage them in the material. Thank you!